I seem to have gotten my blogging mojo. So this post is an update review on the Forever Clair, FC from here on, range of skincare products i got some time back. These are the FC Blemish Control Soap (reviewed here), FC Blemish Control Toner (reviewed here) and the FC Multifruit Cream. I have reviewed all of these except for the Multifruit Cream because i keep on postponing it. Will do the post later i promise. So i'm here again sharing deets on this look i recently did using some of the products i got from EJbeautystore.com which i shared in this post. I shared this pic on instagram @beautiquegh_mua and my facebook page Beautique Gh and the response to put up the tutorial video was overwhelming so here it is. It's beginner friendly and very simple to re-create. All the products used are listed below and most or similar can be gotten from EJBeautystore. Kindly feel free to comment and subscribe. Earlier this year my dear friend, sister beauty blogger and MUA Evita of Evita Joseph Beauty launched Ghana's first ever premium online makeup store, www.ejbeautystore.com. What I can tell you is that, it is as a result of months and months of hard work and preparations. I am really proud of her. So when it was officially launched i quickly went unto the site to feast my eyes, and oh my! i was in heaven. I quickly created my account which was super easy, btw, and went about clicking away and placing items in my shopping cart. It's amazing to find international brands that are available right here in Ghana. Even more incredible to be able to sit in the comfort of your home or office and place an order and have it delivered right to your doorstep. No wahala! Hello beauties, so i'm here today with another beauty post sort of sharing with you my 2014 makeup wishlist. This was inspired by +Evita Joseph who recently showed her updated wish list. I believe it's important to make a wishlist as it helps to properly save, budget and buy only whats necessary and prevent impulse buying thus saving you lots of money. This is my makeup wishlist for my kit and personal use which i have put into various categories. I know it will be nearly impossible to buy all the products on it for this year but i will use it as a guide. I am also not saying I am going to get all these too, lol i wish! As and when i make a purchase i will update this list by crossing them out. I hope to really follow the list and not get swayed away. So God be me Helper! I didn't include essentials such as lashes, disposables, etc because those are a must always have for my kit. Do you have a makeup or beauty wishlist? Kindly share with me. I hope this post finds us well. I recently received some goodies from Dark n Lovely Ghana that i wanted you to have a sneak peek. These are products from the new Braids'n Weaves line that has been very recently launched. Dark n Lovely are always bringing about new and innovative products targeted for the black hair. I remember their relaxer was the only one i used when i used to relax my hair among other maintenance products. So when i was asked to review these products i gladly accepted. i am really excited to be bringing you some very biiiiiiiig news. AFROTASTIC 2014!!!!!!!!!!!!!!!!! Yes! 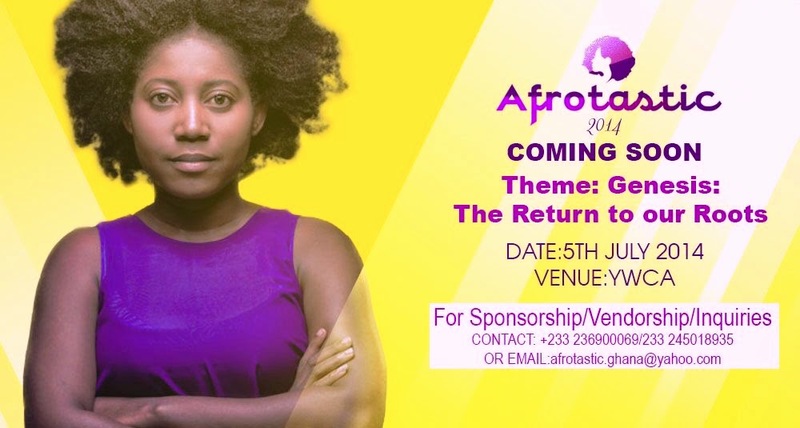 As you may have seen from the lovely new banner for the blog, Afrodiva and myself are hosting the long awaited natural hair meetup in Accra on the 5th of July, 2014 at the YWCA, Adabraka opp the Holy Spirit Cathedral.